Veld & Vaas designs and creates the floral decoration of special occasions and locations: from wedding, birthday and children’s parties, to jubilee, farewell, opening, photo shoot and installation. The company was founded by artist Denise Collignon and landscape historian and floriculturist Mariette Kamphuis. The fascination for the wondrous flower and plant world brought both together. Veld & Vaas stands for a company with two personalities: art and landscape. 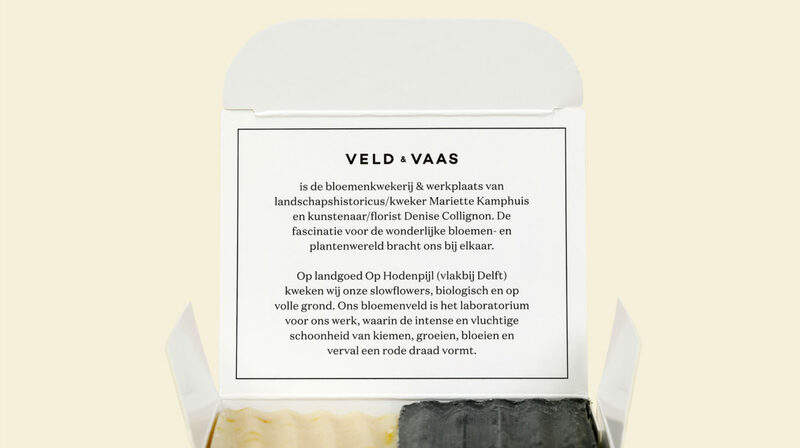 The work of Veld & Vaas is characterised by vegetable materials, folklore, and historical and contemporary (floral) art. They feel part of a long tradition and pursue this to culminate into topical insights; ecological, involved and with a dose of humor. This emerges from the aphorism green fingers, clean hands: pure substantial. 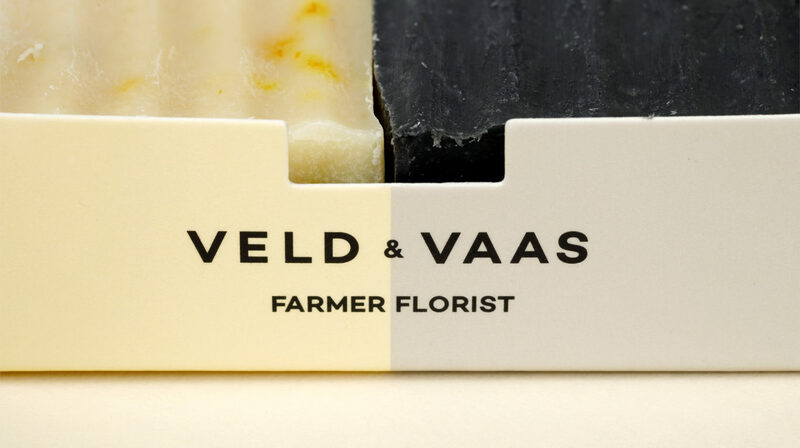 Veld & Vaas presents itself as a symbiosis of two worlds, which formed the starting point for the packaging. 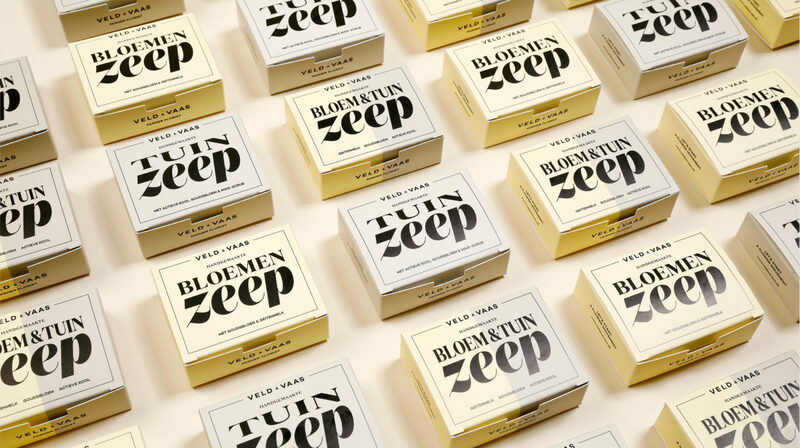 The packaging is adorned with both serif and sans-serif typefaces; the typefaces ‘Domaine Text’, ‘Campton’, and a customised ‘Domaine Sans’, which embody both the typography of today and the early 20th century. 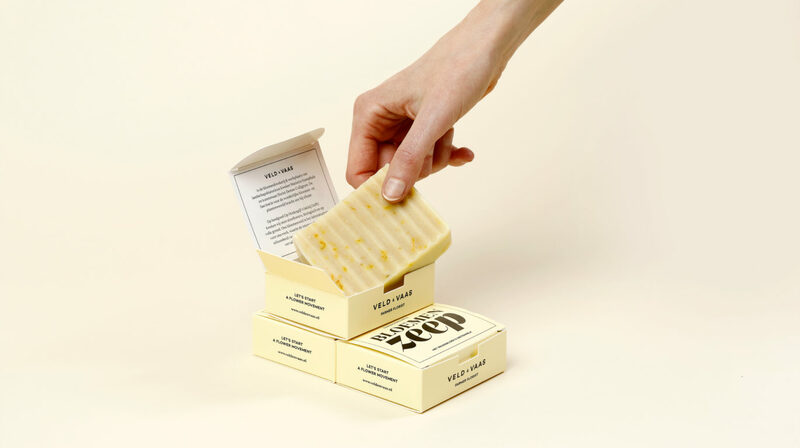 The color of the packaging is derived from the content of the soaps / ingredients (marigold and activated carbon), which also come together in a dual-colored version with both types of soap. The result is a timeless-looking package, in which the story of the inventors can be seen on the inside of the package. As soon as you open the package, you will be met with the aroma.